First off, this is not a review, nor is it a critical piece of any kind, instead, I’d call this article a report on an introspective experience – monitoring myself as I was reading Haakan Sandell’s book of poems, Dog Star Notations, for a relatively long period of time. The subject of my l'art pour l'art experiments was my relation to the book and its content. I kept it at hand all the time – on my desk, not on a shelf – so I could pick it up, take it with me, or just open it up whenever I felt like it. Poems, quite evidently, although delivered in books, are totally different from novels, cause you read them non-linearly. Also, just like musical pieces, poems also call for repeated encounters, repeated reading sessions, and unlike novels which we receive at once, poems and music will absorb in our minds gradually, and by due course of time. I mean, sort of. Not at once, at least. 'Dog Star Notations' -- book cover. 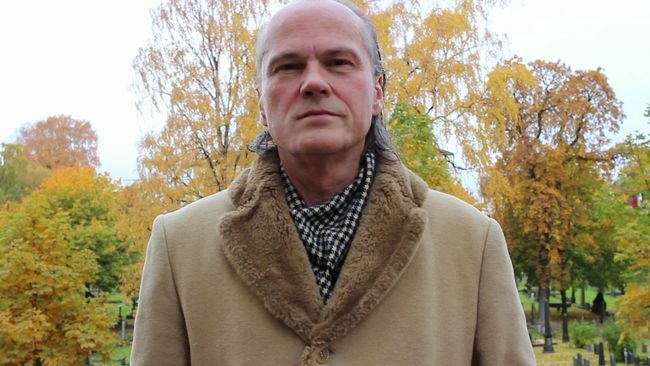 Håkan Sandell: 'Dog Star Notations' - Selected Poems 1999 - 2016 Translated by Bill Coyle. 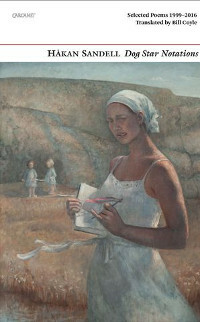 Cover painting by Helene Knoop. My approach was – without thinking much about it – the broadest possible: Why do we read poems, in the first place? That's what I could observe introspectively every time I picked up the book to take it with me to a sunny, snobbism-free cafe, for example, or just to the nearest armchair, or to the sofa. To be sure, this question is not about what makes us enjoy reading poems, when we're already reading – cause that part is clear – but what makes us, time after time, want to switch into that 'mode', and start reading poems. What is it that we seek when we open up a book of poems? This became my base query, although it was not really question inasmuch as I never set out to find an answer to it. It just came as a finding, after a relatively long period of reading Dog Star Notations, which was a beautiful experience. Reading a poem is to be exposed to a flow of images, more precisely: to be exposed to and taken by that flow. It is a trip, in the fullest sense of the term, including the psychedelic. When you start to read a poem, you'll sit down, take a comfortable position in order to be open for the transmission. But it is not like watching a video, cause the video can play even without your cooperation, but a poem won't. The trip generated by a poem only takes place if you're… reading it, if you make it happen, if you assist in the happening. If you process the words, like a processor does in a computer, “executing the commands”. Reading a poem is work, which we do in hope of some gains. This is my spontaneous finding #1. However tempting it is to say that getting to read a poem is like taking a piece of sweets from the table – an easy move which promises immediate pleasures – my introspective experiments prove otherwise. I should say that starting to read a poem is like taking the road, like setting out to climb a mountain. It is an endeavor. It takes courage and strength, and vitality (and good mood, and an undisturbed state of idleness). But it is also like an investment which means that it'll all come back, double-fold or better. That is, you throw in your courage and vitality, and you'll gain something which your level of courage and vitality grow significantly. It requires energy but it results in a release of energy. This is my spontaneous finding #2. Reading poems is gaining experiences, for sure, but what kind of experience do we gain exactly? Is it what's “depicted”, or… the way that it’s “depicted”? A comparison to video comes handy again. When we watch a video, say a tv program on National Geographic, we'll gain new experiences. We'll learn what it is like to climb a mountain, for example. When we read poems, however, what we experience is not directly what the poet makes us see – on the stage of our mind – but how s/he makes us see what we see. It is not what we see but the way we are made to see it which we gain as a new experience. Seeing scenes, people, happenings through the eye of the poet - that's our new experience. Seeing through her/his eye, seeing through her/his mind's consciousness. Poets, good ones – sharp ones like Sandell – create poems in a special state of mind. And besides the scenes, movements that they “record”, this state of mind is also recorded in the image, in the poem that they're working on. And this very probably our greatest gain, this higher level of consciousness. This is my spontaneous finding #3. Haakan Sandell's poems are very intense trips. They'll swiftly take you, drag you in, pull you along, shoot you up, throw you away, and when you land somewhere in the end, all you'll know is that for this short period of time you were able to see much more of everything than normally. Notations mean more than just “notes”, “notations” suggests a systematic activity of taking notes. As if recording something. So it could be played. Viewed again. Seen again. Tasted and experienced again, like when we watch an old photograph, or take a bite of Proust’s madeleine. Long-long lines... running down in the slim body of the two verses, all in magnetic order, not only making sense but building up a sensation of beauty too... It is a continuous flow without stops, it only has spaces and short pauses for taking a breath... This is his compositional virtuosity. He is a master fencer. With swift moves, and a clear mind. He is master director of photography, beautifully controlling our perception. This is Haakan Sandell. Like a time-traveler. A participant and an observer at a party – being there and being distant, at the same time. While there, removed to the abstract space of reflection, as if viewing the present from the future, or from just anywhere outside of the moment, outside of time – this is the side-effect of being a notation maker. Seeing it as it’s happening. Seeing it from outside. Observing everything as if thoughts, feelings, moments, stories, people, faces, glances were large crystal objects floating in space, which he can go around and inspect thoroughly. His art is extremely analytic! It all appears as a depiction. A virtuoso depiction, of a party, an account of a once existing moment. But... our poet has his “sting”. His poems, though they are sweet, hurt in the end, like a whip's tail. His trips don't bring us a satisfactory feeling like “yumm, that felt nice”, but instead, a feeling of hollowness. We are practically exposed to the vastness of the universe, so to say. There is this guy who comes to this party. It's just a night in Oslo. Just a party. Probably as boring or lively as it would be anywhere else in the Western world. But our poet, like a magazine photographer in the 1930s, picks this newcomer guest as the medium by which he can depict it all. And yes! In the end, we say “yes!”, cause all the long and sparkling beautiful lines descend to the completion of an image, making us to recognize that this young and beautiful guy was naked under the partly open fur, and that he was “the king”, “the centre of of the party” – which means, if I may translate it, that he took everybody's attention without provoking dislikes. Once the picture of that moment, of that once existing scene is completed, it is alienated all of a sudden… and we are sort of thrown out to space, and made to see the party and everything as past, and small, and faded, see it all from a satellite's perspective. Cause our poet – our guide on this guided tour to this scene in the past – wrapped it up like this: “You caused all to remember our beginnings”. It's closed down and sealed with just one swift move in the end. What was live before our eyes, becomes past, becomes a recording. This end-line is clearly multi-functional. By mentioning “remember”, our mind is directed to see what we were viewing, all of a sudden, as past and long gone. Also, this is a conclusion, by which he – our poet, our guide, our medium – makes us finally and ultimately identify with him, become one with him. His memory becomes ours, what he experienced, becomes our experience, and on top of this, we saw all that through his eyes, and he made us reflect on it “through” his mind’s consciousness. The art of the artist, I mean Sandell's, is not about the music of the words and lines – that's part of it, true, but it's not about that. Not about the sound of it. It is about the clarity of perception… All the statements, all the images, all the stories depicted – and projected on the stage of your mind – get you involved in a higher state of consciousness. It's like a girl's hand, a daughter's hand, trying to wake you up… while you're deep in your game, deep in your business – deep under the snow, probably motionless. With his swift moves, he's provoking you to follow, first with your eyes, then with your mind. It's like rescue breathing. It takes you, and you submit, follow, learn, take the rhythm. Cause you realize the pattern. You realize that it's all natural, that this is the natural way. The way of breathing. The way of seeing. It was an elevating journey to read Sandell's poems, time after time, randomly choosing, for over a year – and I can’t thank Bill Coyle enough for re-creating them in English.